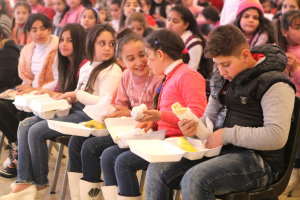 Iraq: In the first newsletter of 2018 I briefly described Christmas celebrations for Christian refugee children in four nations: Nigeria, Lebanon, Jordan and Iraq. I supplied very little detail for the events in Iraq because for the first time since the program began there, I was not present. For the previous three years I attended every Christmas event in Iraq, but was unable to this year because of airport closures in the Kurdish region of Iraq. I have now received full reports from our ministry partners in Iraq. Of particular interest are those concerning the three Christmas for Refugees events in the town of Qaraqosh. 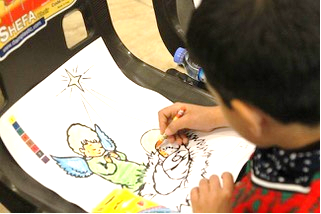 On Christmas Day 2016, not a single Christian child was in Qaraqosh. I know this because just before Christmas that year, I led a convoy of trucks with food and water from Erbil to Qaraqosh to bring badly needed aid to the Christian militia guarding the town. When I again visited Qaraqosh in June 2017 only a handful of families had returned because of the level of destruction and the unsanitary conditions made living there nearly impossible. Just one year later in December of 2017, there were about 5,046 families, but the exact number is variable because some give up after a short period there. Living in a burnt out home with no major appliances such as stoves or refrigerators is difficult, especially for those with young children or family members having special medical conditions. Below is a report on just one of the three events in Qaraqosh as I received it from our ministry coordinator in Iraq. 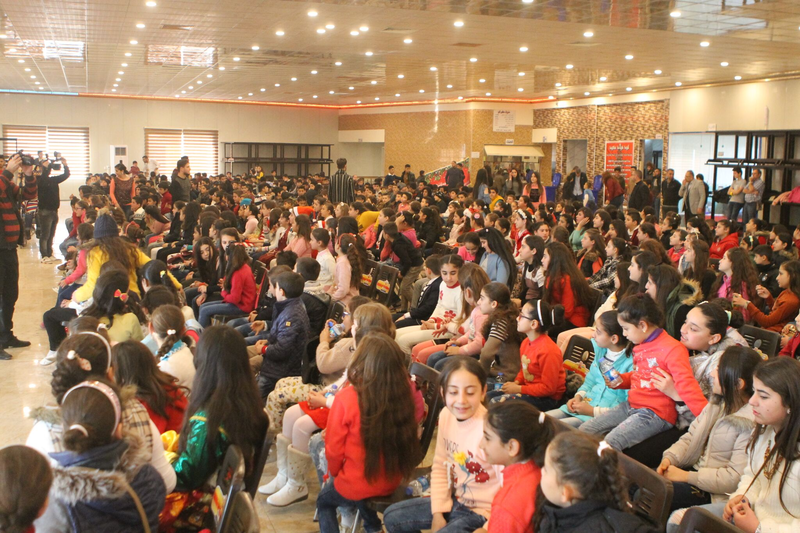 In all nearly 1,000 children attended events in Qaraqosh. This town has been free of Christian people and controlled by ISIS troops for more than three years and now unfortunately, we can see many of the houses destroyed by coalition forces airstrikes reportedly aimed at neutralizing a car bomb. Nearly all of the buildings were burnt, severely damaged and filled with garbage and dirt. The civilians are still waiting for the reconstruction efforts they need so much, generators, electricity, water, …etc. In spite of all these bad conditions in Qaraqosh many civilians decided to return back to their houses, they are concerned about the lives of their children and it was really a great privilege and tremendous blessing to have an opportunity to reflect Jesus light and show the love of Jesus to all poor children surrounding us and we felt the reaction of gratitude and glee that appear in the faces of these children due to the blessed time we spent with them in worshiping, praying, distributing gifts and sharing food all together. We celebrated the birth of our lord Jesus with 447 Christian kids from ages 10 to 11 years. The responsible pastor in the local church at Qaraqosh told us 440 children and we were surprised that this number was increased rapidly to 447. I would happily like to inform you that five members from our team cooperating with four pastors and 28 members belonging to the local church acting as the hands and feet of Jesus to provide Christmas for the children. 1- Worship time: we had a blessed time with these humble kids and the most amazing thing is that when we look back at the pictures we feel that we returned to our childhood when we were singing Christmas worship songs with this huge number of lovely kids. 2- Sketch about Jesus birth: It teaches them how to be able to live the joy of Jesus birth through this holy occasion regardless of their bad current conditions. 3- Break time: includes snacks of pop cake and milk. 4- Competition and sport games part: They’ve enjoyed participating in diverse games and sharing their opinions without limitations. 5- Coloring time: Its favorite time for kids according to their ability to express their deeply inner feeling through it. They were coloring picture of Jesus as new baby born in a manger and thank God for the food that He himself provided to them. Praise the lord! 6- Lunch time: they have lunch altogether which contains sandwiches with juice and fruits. And they listen to the worship songs. 7- Zeal time for kids (Santa Claus arrival): They were very excited to see Santa and wonder what did he bring for them. The fact is that God, is the one who wanted us to be in this position and he is the one who created this opportunity. 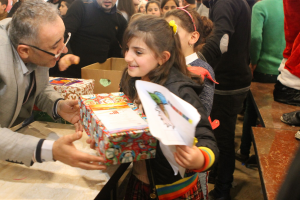 The reality of Christmas was the blessing of the means by the Christmas for Refugees organization.